Strongmen tend to get even stronger as they age. 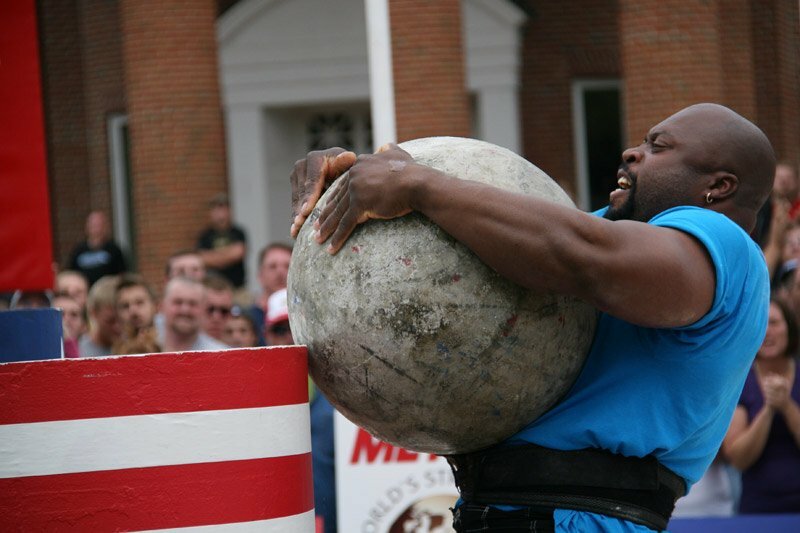 Mark Felix is one of the oldest and strongest strongmen on earth. Got the stones to train with him? I started training weights in 1993 while working for Carnival Cruise Lines as a bartender. I lifted in a makeshift gym: a storage room at the front of the ship in the crew quarters, with discarded pieces of equipment left by crew members and unwanted items from the passenger gym. I also trained at gyms (usually Gold's) in various ports on my days off. I trained around the world, however and whenever I could. In 1996, I competed in natural bodybuilding competitions representing Grenada, West Indies. In 1997, I moved to the United Kingdom with my wife and continued to compete in natural bodybuilding competitions. Work commitments and the birth of our first son set competition momentarily aside. 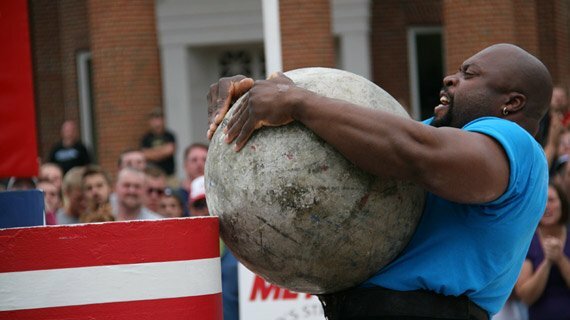 I continued to train and work out until 2002, when I filled in at a strongman competition for a friend. In a line-up of Britain's strongest men, I came in 3rd and won 3 of the events. I had never touched strongman equipment before, but I was instantly hooked. I started making a 4-hour round trip every Sunday to train at one of the few strongman training camps in the UK (at that time). I loved the raw outdoors training: lifting, pulling and throwing. It was all-natural and insanely addictive. Within a year I was invited to compete against Britain's top ten strongmen. I placed 2nd to Glen Ross. 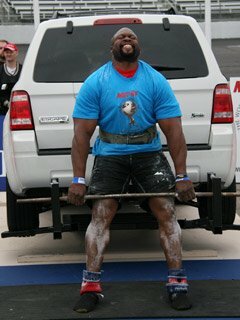 I made my first appearance at World's Strongest Man in 2004, in the Bahamas; I placed 7th. In 2005, I bought equipment from the training camp I was commuting to on Sundays and moved it 5 minutes from my house. Anything to train more often. I signed with IFSA and won IFSA Britain's Strongest Man the same year. My travels began: Canada, China, Brazil, Russia and Poland, just to name a few. 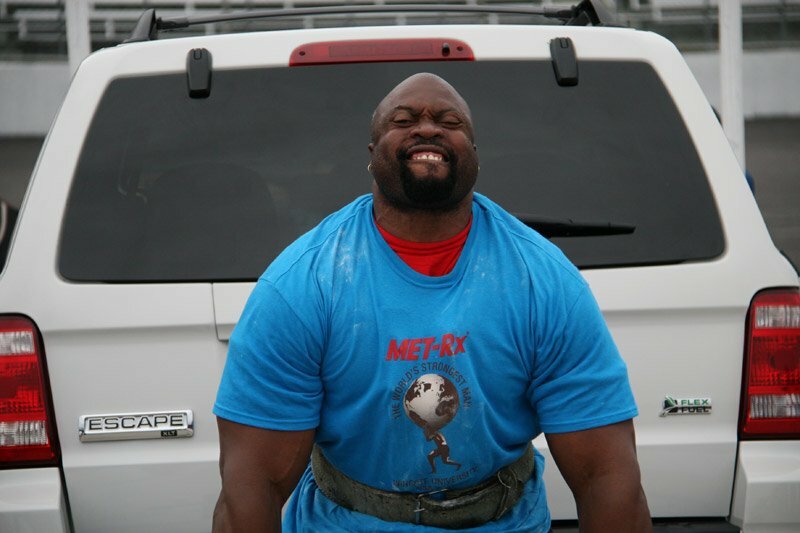 In 2006, I returned to World's Strongest Man and placed 4th, my highest placing to date. I continued to train strongman and competed at regular international competitions. I placed 2nd at Europe's Strongest Man and Britain's Strongest Man. I've been fortunate enough to try my hand at Highland Games, which I love. I'm just not very good at it. I still wear my kilt in Strongman and highly recommended the Highland Games to anyone, especially if your thighs are on the larger side. There's no escape from lifting this Escape. In 2007, someone suggested I try grip events. I became the first person in the world to lift 300 pounds on the IronMind Rolling Thunder One-Hand Deadlift, at 301 pounds. I remain unbeaten. IronMind has redesigned the Rolling Thunder. I haven't lifted 300 pounds on the new one ... yet. 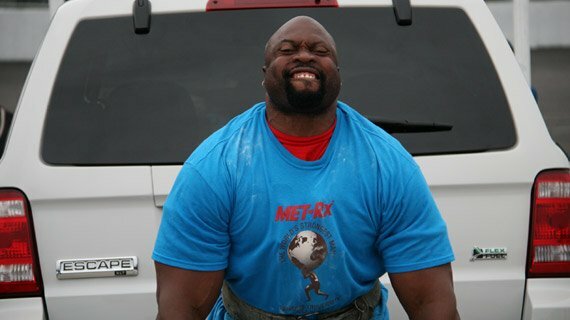 I tore my biceps in 2008 on the last event (atlas stones) of the qualifying round at World's Strongest Man. Luckily I was able to get surgery within 24 hours in West Virginia. Four months off work made for a slow but complete recovery. During my downtime, I worked on one-hand deadlifts and found I was pretty damn good at it. 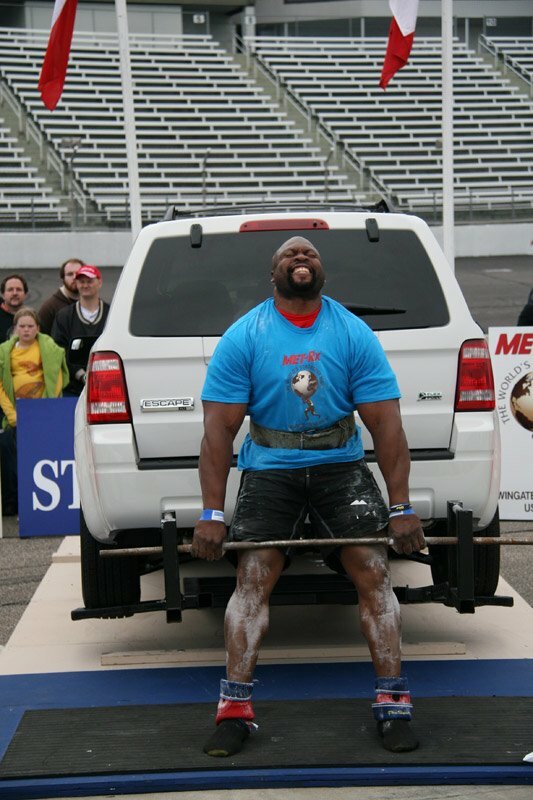 In 2010, I broke the one-hand deadlift record with 225 kg. Known for my deadlift, I joined the International Powerlifting Federation in the UK and broke the UK record on deadlift with 400kg. Clashes with Strongman competitions have made this my only IPF competition. Daily diet doesn't change much, except when I'm travelling. Then, my food intake becomes a "what's available" intake. I travel with MET-Rx whey shots and MET-Rx meal replacement sachets so I at least have the protein. I've been sponsored by MET-Rx since 2007. It was a great fit; I've actually used their products since I started bodybuilding. Although I endorse all their products, my favorites include MET-Rx Amped and Protein Plus. Amped is the perfect fuel for a great workout, even after a long workday. Protein Plus has always been a favorite of mine; it's easy to drink, produces no bloating, and leaves me with a clean complexion. *Note: I always drink at least 5 liters of water per day. With steamed vegetables or broth. This is on treat days only. I eat a lot of fruit and vegetables, maybe not as much meat as people may think. I eat every 2-to-3 hours through the day. I burn a lot of calories while working, so I need to eat regular, smaller amounts rather than a big, occasional meal. Evening meals contain carbohydrates to push me through the night. I limit my caffeine intake and use it when I need it pre-training. On competition days, a black coffee does wonders. RTDs, whey shots, bars, jelly. Anything that's nutrient-dense and easy to consume. I train at different gyms. I find this complements my training. I also train outdoors in my yard, as often as the temperamental UK weather allows. My training changes slightly depending on competitions and events. I try to maintain a consistent training split as much as possible, so I don't overwork anything or skip anything. Day 1 might not be at the beginning of the week. Ok, I'll put it up here for you one more time, but don't knock it off again. I start with a 30-minute warm-up of circuits, bands and cardio, depending on if I'm indoors or out. I take one rest day per week. This is always a different day, when I feel I should rest. With someone on my shoulders if they're around. For the past month I've had a personal trainer once per week who puts me through my paces for an hour, mostly circuits and core work. This has made me slightly leaner, but more balanced with a much quicker recovery. If I do cardio without my PT, I do medleys and circuits. I'm always asked how I train deadlift. It's basically how I feel. Some weeks I might have a 350 max, others a 400. I just increase weight with each set. I don't put too much pressure on reaching a certain weight. If I'm feeling up to it I lift it, if not, I don't even attempt it. 4 hours of event training (I currently put this in twice per week and alternate with my overhead workout). Cardio medleys, 2 circuits: barbell clean and press, free squat, tire box jump. This varies. I'll practice anything I'm training for at the given moment. Each competition is different, so I work only toward my next competition or on my weaker events. Allow all body parts to rest and recover, then repeat. I change the exercises every few months with a new program. I lift as many free weights as possible to incorporate my core. Routine is great, as long as it isn't prolonged. Keep notes of your achievements, diet and sleep (or lack of). Record-keeping can affect your training and outcomes. I'm often asked how long I will continue training. Y'know what? I will always train. I've always been active. I live to look after my body. I will continue to compete as long as I improve. My PRs continue to grow, and my overhead (which has always been a weakness) is at last on the up. I love strength sports. The camaraderie has to be unlike any other sport. Your opponents are also your support. The only downside is the stereotype of "strong." People think that anyone as big and strong as we are has to be taking something. If people wouldn't limit themselves by such ideas, I'm sure they would achieve more. I respect my body and train wisely. It's important for me to set a good example for my children and hopefully show that you can start training at any age and achieve your goals. Age is only a number. I'm proud to be the oldest competitor at the World's Strongest Man, giving the youngsters a run for their money. I have various videos of my own on YouTube: check out the accounts MarkFelixtv & Ayebygum. I'm also on Facebook and Twitter.